At Coast Diamond we have had the privilege of making countless couples’ dreams come true with the gift of diamonds in 2015. 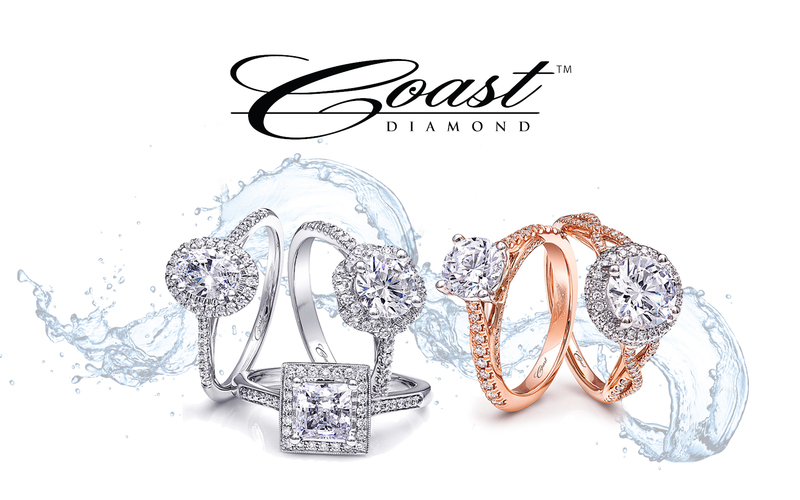 From saturated color to rose gold, from unique shape and design to the halo… No matter which you chose, it brings us great pleasure to share Coast Diamond’s best of 2015. The Halo Diamond Ring: The most popular style of engagement ring for 2015 was the halo diamond engagement ring. The halo tells the one you love that they are the center of your universe. Coast Diamond’s floral double halo with a round center stone (our featured image above) was voted follower’s favorite in our #8RingsofSparkle Facebook Campaign of 2015. Colored Gemstones: The colored gemstone engagement ring was a one-of-a-kind way to surprise your loved one in 2015. A yellow gemstone was the choice for Iggy Azalea’s engagement ring. Other famous colored gemstone engagement rings: Kate Middleton (blue sapphire), Jackie Kennedy (emerald), and Jessica Simpson (ruby). Unique Shape and Design: Choosing a unique shape of a stone or unique ring design is a way to truly personalize your jewelry selection. We hope you have enjoyed a look back at the stunning Coast Diamond trends of 2015. We look forward to the love and beauty that 2016 brings. ‘Tis the season for marriage proposals. What better way to wish you holiday cheer than a compilation of the best marriage proposals of 2015? Enjoy! Life is a roller coaster, so why not propose on one? We hope these marriage proposals made you smile like they did us. There’s nothing like a wide-eyed, hand-over-mouth surprise like these brides-to-be experienced. We would love to feature your proposal in the Coast Diamond Holiday proposal compilation next year. Let us know if you propose with a Coast Diamond this holiday season or in 2016. Tag your photos with #CoastDiamondproposal. Coast Diamond presents Summa Jewelers of Kirkwood, Mo as featured retailer of the week. Jim Summa is the driving force behind Summa Jewelers. His love of jewelry began at the age of 14 when his sister gave him a jewelry tool kit as a gift. This love of jewelry making took him from North Carolina to Southeast Asia, and on to Los Angeles for formal training in metal-smithing, diamonds and gemstones. Jim returned to St. Louis, Missouri where he worked for a local jeweler for 5 years before opened the first Summa Jewelers store; first in downtown St. Louis, then in his hometown of Kirkwood. In 2000 Jim purchased an historic building in downtown Kirkwood and renovated it to the community’s delight, which resulted in several awards over the years. Summa Jewelers enjoys sharing their expertise in diamonds and gemstones in this unique setting because they know you will be wearing your fine jewelry for generations. When you visit Summa Jewelers they would love to show you these and other exquisite Coast Diamond pieces. Summa Jewelers: Coast Diamond classic engagement ring with cascading diamonds on the shoulders (LC5219) and matching wedding band that sits flush (WC5219). Summa Jewelers: Coast Diamond engagement ring with diamonds decorating every curve of this “flower in bloom” design (LC5225). Congratulations to Summa Jewelers of Kirkland, MO for being Coast Diamond’s featured retailer of the week! Adolf Jewelers’ annual trunk show is this weekend, December 11th &12th, 2015. This is a great time to see the entirety of Coast Diamond designer jewelry line, while also enjoying the best prices of the year! You don’t want to miss out! Costello Jewelry Company’s client appreciation event is this Saturday, December 12th. Join us in Naperville this Saturday for a seriously high-end extravaganza. A Coast Diamond representative will be on hand to show you special pieces perfect for your holiday shopping list. We look forward to seeing you at Adolf Jewelers in Richmond, VA or Costello Jewelry Company in Naperville, IL this weekend. Coast Diamond is proud to present National Jewelry Company of Ruston, Louisiana as featured retailer of the week. National Jewelry Company is an independent jeweler that has served generations of families in the Ruston, Louisiana community for over 35 years. When you visit National you will feel like you are part of the family because the staff has a passion for personalizing your shopping experience. National Jewelry Company’s customer service does not end at the sale; after your purchase of fine jewelry, return to National for free cleaning, resizing or upgrading. Your relationship with National Jewelry Co. will last a lifetime. Stop into National Jewelry Company this holiday season for your holiday gift needs, like these gorgeous pieces of Coast Diamond designer jewelry. National Jewelry Co: Coast Diamond classic hoop earrings with diamonds inside and out (EC5134). National Jewelry Co: Coast Diamond wedding band featuring 0.75CT of round brilliant diamonds (WZ5001H). National Jewelry Co: Coast Diamond wedding band available in white, yellow & rose gold (WC5191H). Congratulations National Jewelry Company for being Coast Diamond’s featured retailer of the week.